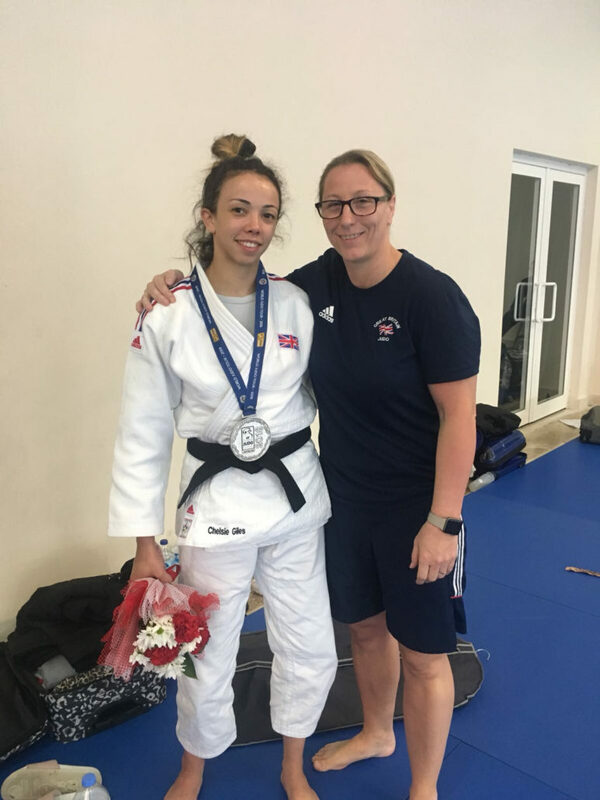 Chelsie Giles claimed her first Grand Prix medal in excellent style on the mat during the first day of competition at the Antalya Grand Prix in Turkey. Prior to today, Giles’ best finish at a Grand Prix previously was seventh place, a result she achieved at the Tunis Grand Prix just a few months ago. The 21-year old Coventry judoka came up against the Kosovo’s current World No.5 Distria Krasniqi in Final. Krasniqi had been in dominant form throughout the day but Giles proved to be a worthy opponent throughout the Gold medal fight. She refused to be bullied by her power but got caught at the mid-way stage by a waza-ari and was always chasing the contest following that. In the dying seconds Giles launched a final attack but was caught by seoi-nage from Krasniqi to end the contest. She entered the competition in the second round following a bye in the first and immediately showed her intent for the day with a quick stoppage over Russia’s Daria Bobrikova. Lasting just over a minute, Giles dominated the contest and eventually found the winning combination via a well-timed throw for ippon. That victory set up a mouth-watering contest against Hungary’s World No.16 Reka Pupp. The two had met once previously in competition, with Pupp prevailing at the Oberwart European Open back in February 2017. But Giles was keen to put that record straight and she did so in some style. She regularly frustrated the Hungarian with her style of judo and forced her to pick up two shidos. The contest looked to be over at the halfway stage as Giles did brilliantly to unbalance Pupp and she looked to be landing flat on her back but she did superbly to rotate in the air and land on her shoulder. A waza-ari score none the less, and it was enough to give Giles the win and secure her passage into the semi finals. It would not get any easier for Giles though as she came up against World No.19 Betina Temelkova from Israel, but following her performance in the previous round, Giles had nothing to fear. It was a contest that lacked any real scoring opportunity though and the four minutes came and went in a flash with the scores level. Golden score commenced and it was Giles who won the gruelling contest, securing a vital waza-ari score to set up the Gold medal contest against Kosovo’s Krasniqi. Kate Howey, Giles’ Coach was full of praise for her young medalist. “Chelsie fought really well today and beat some players ranked well above her. She showed real composure throughout the competition and believed in herself to be at this level. 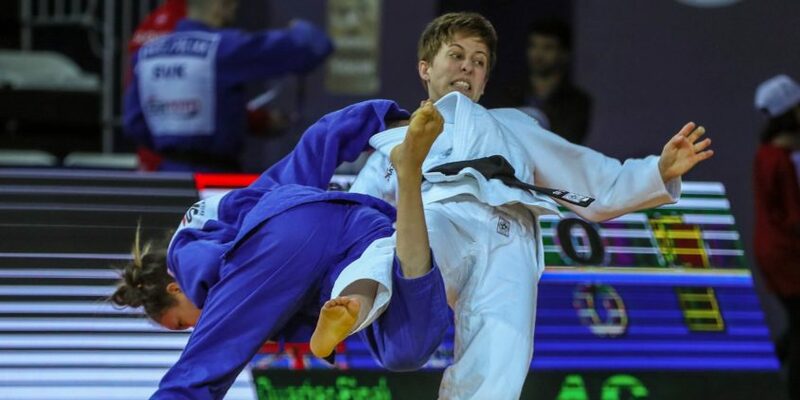 There was earlier disappointment for Kim Renicks as she exited the competition at the first hurdle as she was defeated by Kosovo’s Fjolla Kelmendi by a single waza-ari. Tune in tomorrow where a bumper line up consisting of Lubjana Piovesana (-63kg), Sally Conway (-70kg), Danny Williams (-73kg), Alex Paske (-73kg) and Owen Livesey (-81kg) will take to the mat.